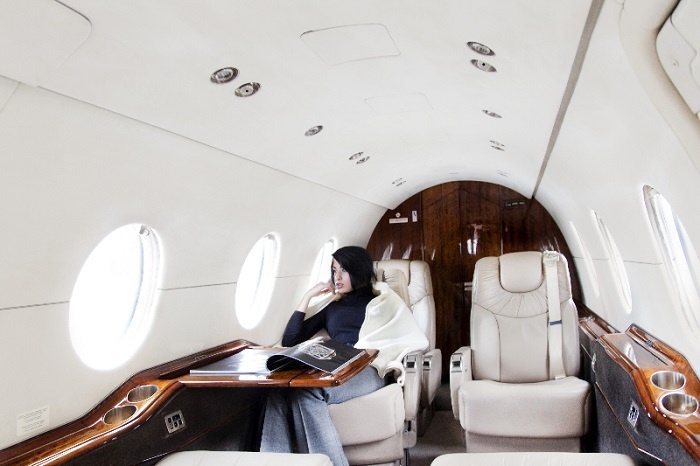 With top-notch safety features, a luxurious cabin and fast cruising speeds, the Hawker 400XP is a popular choice for business flights and recreational excursions. Ideal for non-stop or mid-range flights, this light twin-engine aircraft has a uniquely structured cabin which allows for expansive head and leg room. Seating arrangements also create a center-club pattern to produce an ideal environment for in-flight meetings for up to 8 passengers. The Hawker 400XP successfully balances performance, reliability and operating costs. A galley, refreshment bar, enclosed lavatory and an accessible rear luggage section creates a pleasant flight experience along with amenities such as power outlets, telephones and satellite radio. The Hawker 400XP successfully balance performance, reliability and operating costs. The details that make this model stand out start with the length of the cabin coming in at 15.5″, the height at 4.8″, and the width at 4.9″. The cabin features a flat floor with an oval shape, which maximizes the amount of usable space. It comfortably accommodates up to eight passengers. For those lengthier flights, the rear of the plane is equipped with a completely enclosed separate lavatory. The baggage space measures fifty-three cubic feet, giving ample room for handbags and small suitcases. A galley, refreshment bar, enclosed lavatory, and accessible rear luggage section create a pleasant flight experience, along with amenities such as power outlets, telephones and satellite radio. Baggage Capacity: 56 cu ft.
Monarch Air Group, a premier provider of air charter service to countless international destinations, offers an extensive array of top-quality jets such as the Hawker 400XP. When looking to book your next private jet for a combination of functionality and low operating costs, remember that the Hawker 400XP is an outstanding choice. For Hawker 400XP charter rates and availability, please submit the flight request form or call our agents at 1-877-281-3051 for 24/7 support.